‘Arthur’ and ‘Arthur 2’ debut on Blu-ray with 1080p AVC/MPEG-4 video presentations. Warner Home Video is generally fantastic with catalog releases, but I kept expectations low as the films likely did not receive a restoration, and the fact that both films were on one disc. Thankfully the films in high-definition do not disappoint, if you go in with reasonable expectations. These films are not razor sharp, but they never have been nor ever will be. That being said, the films are clearly high-definition from beginning to end with no scene that I think could be confused with DVD quality. There are plenty of soft scenes throughout, but we also get to see a nice upgrade in clarity, and generally excellent level of textures and details. Colors are quite rich and black levels are solid throughout. The films also look quite clean overall, with a nice layer of grain present throughout both films. ‘Arthur’ features an English 1.0 DTS-HD Master Audio track as the lossless option. Also included are French, German and Spanish lossy mono tracks. Optional subtitles include English SDH, French, German SDH and Spanish. ‘Arthur 2: On the Rocks’ features an English 2.0 DTS-HD Master Audio track as the lossless option. Also included are French, German and Spanish lossy mono tracks. Optional subtitles include English SDH, French, German SDH and Spanish. Warner Home Video has included lossless tracks for both films, but neither manages to impress. I really didn’t expect much from the mono/stereo mixes included, so I wasn’t very disappointed by the quality of either mix. The theatrical trailer for the first film is included in standard-definition. The theatrical trailer for the sequel is also included in standard-definition. ‘Arthur’ and ‘Arthur 2’ debut in a 2-movie collection just in time for the release of the ‘Arthur’ remake starring Russell Brand. I have not seen the remake, but after seeing the theatrical trailer I think I can wait until the eventual Blu-ray release, to put it nicely. I love the ‘Arthur’ films; I have always found both films to be quite funny and stupid, which I liked in this case. I was very excited about the double-feature Blu-ray release, especially since I have had to put up with the mediocre DVD releases for years. 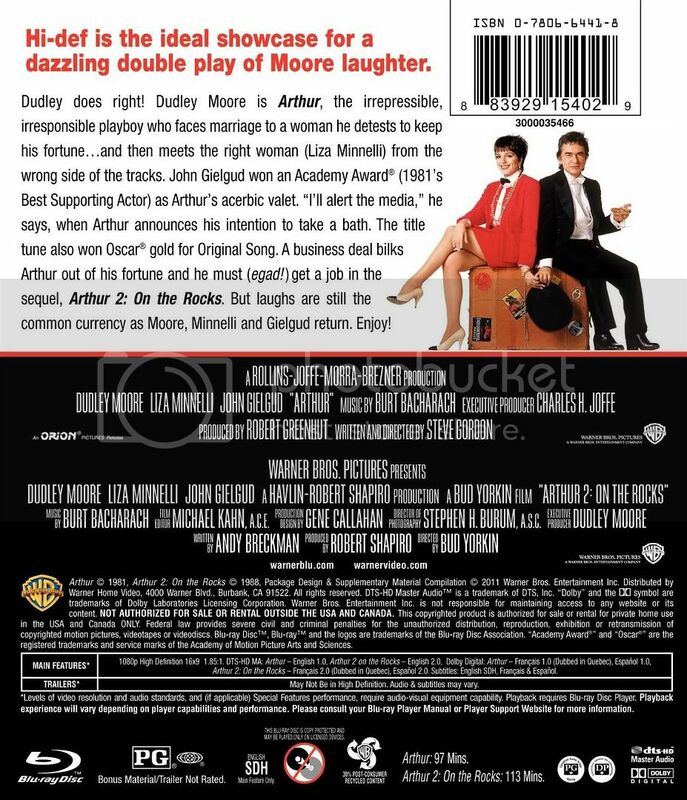 Both films star Dudley Moore and Liza Minnelli. Dudley as ‘Arthur’ is simply fantastic, his wacky humor will not appeal to everyone, but I think he created such a fantastic goofy character. Liza Minnelli co-stars as Linda. ‘Arthur’ is certainly the better of the two films. Like with most sequels, the sequel was quite unnecessary but certainly welcome, I am not so sure many would be willing to buy the sequel separately anyway. ‘Arthur 2’ released seven years after the original and was certainly an entertaining follow-up, but never compared to the original. The ‘Arthur’ 2-Movie Collection features an entertaining set of films. The Blu-ray release features strong video presentations and decent audio mixes. Theatrical trailers are included as the sole extra for each film. Overall this Blu-ray release is definitely ‘Recommended’ to any fan of the films. To Order From Amazon.com, Click Here!